She’s learning to read! Learning to read is a wonderful new adventure for children. Finally the stories they’ve heard Mom and Dad read time after time are coming to life in a fresh way. Reading empowers children. When they see the wonderful way that words join together and form meaning, they begin to see the world in a different light. While the appeal of reading is different for every reader, today we wanted to share a few tips on teaching young children to read through Bible stories. 1. Have your child point out any sight or high frequency words they know before you begin. While they may not know every word in the Bible story you are reading, the words they do know will help them relate to the story. 2. While reading the story, point to each word as you say it. Doing this will reinforce the idea that every word you say has a visual to accompany it. When you arrive at a word your child knows, pause and give them the opportunity to read the word. 3. Choose one new word from the Bible story for your child to learn and sign. One way to choose this word is to read the story first and have your child to listen for a word they like. You could make up a motion or sign to go with it. The ASL sign for Jesus takes the tip of your middle finger of one hand and touches the open palm of the other. Then switch hands. Visually, this shows the nails in Jesus’ hands, a great way for your child to remember this word easily! 4. Choose a new word and add motion to reinforce action. Maybe the word is one that holds action or special meaning and you visually perform the action of the word as you say it. For example, “Be still and know that I am God” could focus on being still. A standard game of freeze tag or play could be transformed to reflect purposefully being still to learn more about God. 5. Help your child listen for the letter sound of a current letter they are learning. At the end of a line of reading, pause and ask your child if they heard the /s/ sound in any of the words you just read. Or before reading the line, say “Listen for the /s/ sound in this sentence.” At the end of the line, ask your child to point to the word that holds the /s/ sound. Bible stories are exciting to children and they will love to learn to read them! Our hope is that the tips above will help you reinforce the reading skills your child is learning and enjoy learning to know God more. 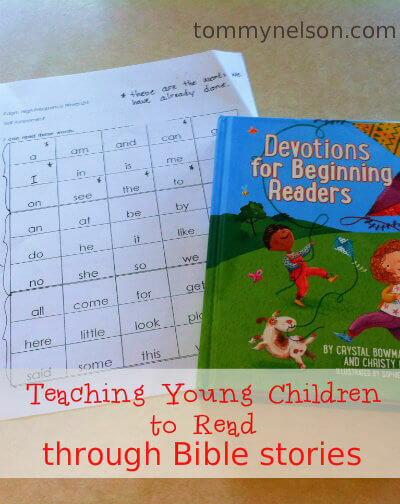 Devotions for Beginning Readers is such a neat resource for young readers. It’s new and a great way for kids to build confidence in their reading skills as they are learning how to have a relationship with Jesus. Each devotional includes colorful illustrations and contains short sentences and scriptures from the International Children’s Bible. Also featured is a “today’s word” segment, a vocabulary word that is repeated throughout the devotion to help children develop their reading skills. What reading tips have you noticed are helping your child learn how to read? We’d love it if you would share them with us today! This entry was posted in Blog and tagged Bible stories, Kids, Reading, Reading Bible stories, Young Children by Rachel Wojo. Bookmark the permalink.